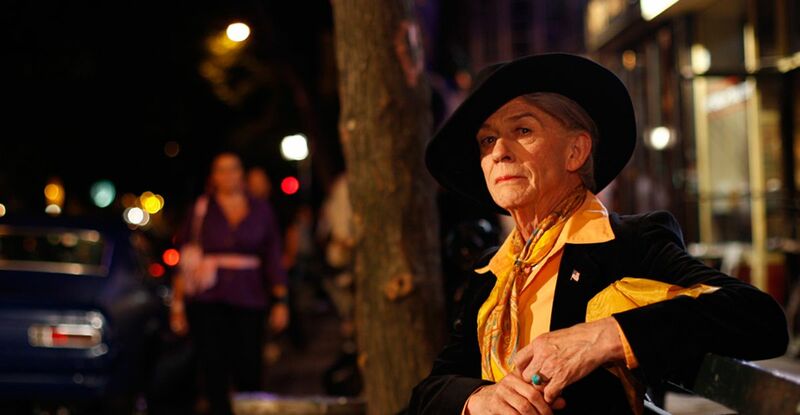 In Richard Laxton’s An Englishman in New York, Quentin Crisp (John Hurt)—the notable makeup-wearing gay activist who was raised in the brutal, prejudice-filled streets of Sutton, England and brought over, at the tender age of 70, to the slightly more welcoming boroughs of New York City—is filled with generous, perceptive philosophies regarding the nature of human beings and relationships, gay and straight. After the success of the made-for-British-TV movie The Naked Civil Servant, which was based on his memoir, Crisp is commissioned by a small theater in Manhattan’s Bowery to perform a one-man show; word-of-mouth spreads about his unfiltered wit and shrewd observations about the gay community and cultural zeitgeist at large, which lands him gigs on late-night TV chat shows via his newly acquired agent (Swoosie Kurtz). His cult-like status grows, but when he calls the impending AIDS epidemic “a fad” in an off-the-cuff moment during one of his performances, he turns a faction of the gay community sour. Englishman is a studied testament to the splintered state of the gay community: It understands how homosexuals may seem like a collective, parading around and screaming for inclusion, but how they can be oppressive within their very own community. During one fish-out-of-water moment when Quentin and his editor friend, Phillip Steele (Denis O’Hare), visit a gay bar filled with construction workers and buffed-up guys, they haltingly realize these men won’t converse with them because the two are not cut from the same muscle-rippling mold. These “clones,” as Quentin puts it, willfully draw lines down the center of the homosexual pack, and though he’s perplexed by this immediate cruelty from his own clan, Quentin overcomes it, proceeding again through life in a jolly old fashion. A BAFTA-winner for Naked Civil Servant, in which he played a much younger version of Crisp, Hurt is utterly spellbinding, sinking back into this colorful and iconic persona with rousing form. Laxton smartly frames the film around Hurt’s dedicated performance, allowing Crisp to remain the cinematic focus as he was in his own world. This fresh look at the gay culture and its desired goals establishes profound insight into what it means to be a true-to-spirit man these days, no matter if he happens to wear a little lipstick and maybe a scarf or two.